Learn more about how you can join Peter and Shelly Zwick in supporting CSUSM students, call University Advancement at 760-750-4031. 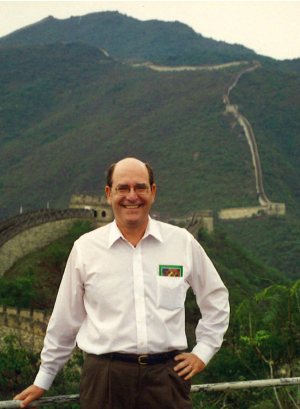 Peter Zwick, founding director of the Office of Global Affairs stands in front of the Great Wall of China. He and his wife, Shelley Zwick, established a bequest endowment to provide scholarships for international students and they created an annually funded Zwick Study Abroad Scholarship. It all started when Peter Zwick spotted an advertisement in The Chronicle of Higher Education calling for applications from individuals interested in establishing CSUSM's political science department. At the time-the year was 1990-he was the chair of the political science department at Louisiana State University. "I asked myself, did I really want to do this for another 20 years?" he remembered. "I applied... and I later learned there were about 240 applicants for my position-so a lot of people had the same idea that I had!" Once hired, Zwick's early tasks at CSUSM included creating a political science curriculum, developing the program and hiring faculty. "One of the biggest challenges was that we were calling ourselves a university of the 21st century," he reflected. "So the question was, how are we going to do political science differently? It was intellectually and physically challenging-but it was really amazing because we didn't have many rules…if we wanted to do something, we could!" Over the course of several years, Zwick began working to establish CSUSM's first international education programs. The role evolved quickly and in the late 1990s he became the founding director of the Office of Global Affairs (now known as Global Education) with the mission to internationalize the CSUSM educational experience. During his tenure as director, Zwick likely logged more frequent flyer miles than anyone else at Cal State San Marcos, traveling internationally to establish the University's name recognition abroad, to create student exchange programs, promote faculty collaborations and recruit international students. Frequent destinations included Japan, Malaysia, China and Taiwan because Asian students tend to study at West Coast universities. In my experience, there were a lot of students who wanted to study abroad but couldn't afford it. It's our hope that this might make a difference for some who might not otherwise be able to go. "In those early years China was the biggest surprise," commented Zwick. "At that time they were just starting to build major cities, and the streets were packed with bicycles. It was interesting because it was just taking off-we all agreed that this would be the country of the next century." Today, Zwick firmly believes that every student's higher education should include an international experience, and the University must continue to attract qualified international students. Now retired, he continues to help build a global CSUSM. He and his wife, Shelly, have established a bequest endowment to provide scholarships for international students coming to Cal State San Marcos, and they have created an annually funded Zwick Study Abroad Scholarship, which assists students who plan to study abroad for a full semester or longer. "In my experience, there were a lot of students who wanted to study abroad but couldn't afford it," he said. "It's our hope that this might make a difference for some who might not otherwise be able to go." This year's Zwick Scholars have studied in countries including Sweden, Chile, Australia, Germany, Ghana and Israel. "For me, it's always been about the students," he said. "I always looked at Global Affairs as building a global university one student at a time. Students who go abroad return very different people-it's truly a transformative experience."